Compiled here are annotated links to resources and references to the movie / video mode on the Nikon D90. Just something to think about, would you shoot stills, or a video of a lifetime sequence of events that unfolds right in front of you? High quality movies don’t just happen, so maybe it’s time for digital photographers to start thinking about video production techniques. With the introduction of better video capture capabilities on the Canon 5D Mark II, read this heated debate on DVXUser.com comparing both cameras. It’s important to know the pros and cons of the video capture functionality on the D90. Here is spectra’s take on what features need to be added to the D90 to make it a truly fantastic video capture device. Video clips are recorded in M-JPEG (motion JPEG) format. You can read more on this format on Wikipedia. The file extension is AVI. It can do 720p video, which is 1280 x 720 pixels. Read Wikipedia to understand what 720p is all about. A brief Google search also turned up related articles on 720p vs 1080p and 720p vs 1080i. Video clips can be recorded up to a maximum of 5 minutes each. Each 720p clip should be approx. 600MB in size. The video mode on the D90 would not be ideal if you want to record, say, an entire concert performance in one take, but for creative movie-making, this is frequently not a hindrance as the majority of movies are made up of short clips (or takes) of less than 5 minutes. These short clips are later edited and merged together to make a complete film. We asked this question and were told it’s a tax issue, nothing else. The fact you can take 5 mins, pause a second then do another 5 mins ad infinitum seems to support this. At hi-def, the D90’s video capture is limited to 5 minutes. But at lower resolution, its records 25 minutes. An 8GB SDHC card should be able to hold a total of about 1 hour’s worth of HD video clips. 16GB SDHC cards are seeing a downward trend in prices, especially after rebates, and those will let you store 2 hours of HD video. The D90 can record audio via the built-in microphone, but only in mono. When previewing the movie, you can hear the audio that was recorded through the D90’s speaker. The 24p frame rate is also a noninterlaced format, and is now widely adopted by those planning on transferring a video signal to film. But film- and video-makers turn to 24p for the “cine”-look even if their productions are not going to be transferred to film, simply because of the “look” of the frame rate. When transferred to NTSC television, the rate is effectively slowed to 23.976 fps, and when transferred to PAL or SECAM it is sped up to 25 fps. 35 mm movie cameras use a standard exposure rate of 24 frames per second, though many cameras offer rates of 23.976 fps for NTSC television and 25 fps for PAL/SECAM. VR (vibration reduction) continues to be available for a VR lens is mounted on the D90. You can pre-set the desired Picture Control (for instance, Vivid or Black and White), White Balance and Exposure Compensation before starting to record a clip. Exposure is automatically determined and adjusted via Matrix Metering during the recording, but any pre-set exposure compensation will continue to be honored. Exposure can also be locked before you start recording. Normal shutter speed for movies is 1/2 the frame rate or 1/48 second (called a 180 degree shutter). With movies it is common to use neutral density filters so a fairly wide aperture can be used in daylight and still use a 180 degree shutter. Other shutter speeds are also used but the look will be different. Video actually benefits from some subject blur and thus most video cameras don’t attempt to shorten shutter speeds too high. When you use very fast shutter speeds with video streams you get a very wrong look to them. An example of such a ground glass adapter is the $1,199 USD Letus35 Extreme. There is no flip-out, articulating LCD on the D90, so it’s quite a challenge to capture video with the camera held high above your head. You can’t autofocus (AF) the lens while shooting video. You can only manually focus the lens. Photographing people in a party, and trying to keep running kids and adults in focus with everything front and back sharp, is probably not a good idea given the shallower DOF on the D90 and lack of AF compared to a camcorder. Most serious movie-making or shooting is done with manual focus anyway — that’s why it doesn’t matter to this sort of crowd. … critical focus is MUCH easier to achieve at the lower resolution of 720p versus the native still photo output. MF will be several times EASIER, not to mention the eye’s lower sensitivity to focus on moving pictures. Handholding the D90 while recording won’t be anywhere near as easy as holding a dedicated camcorder with a single hand and operating the zoom rocker and record button with your thumb. With the D90, you’d need to use both hands — your right hand grips the camera, while your left hand turns the focusing ring and / or operates the zoom. Because you can only frame the video by using the rear LCD (no, you can’t use the optical viewfinder), it will be a tiring experience to hold the camera in front of you, with both hands, for extended periods of time. And yes, the D90 plus lens is much heavier to hold than a compact digital camera. There are no external input ports for mics or mixers. 1080p + Pro audio options + a dedicated Video CODEC like Cineform and it will wipe the floor with MOST if not all PROSUMER camcorders. In the light of these shortcomings, know that having the video mode on the D90 doesn’t mean you can simply replace your camcorder. Mount any of your lenses on the D90, and shoot a video. There’s no limit to the possibilities, you can use Nikon’s 10.5 fisheye lens, Tilt-Shift lenses, or use a dedicated macro lens such as the Sigma 150mm f/2.8 or Nikkor 105mm VR and capture some stunning close-up videos. Or mount a fast lens, say a Nikon 50mm f/1.4D or Sigma 30mm f/1.4 and capture some interesting subject with the background totally blurred out. Journalists can take the usual photos when covering an event, but now have the additional convenience of shooting some video sequences to add to web-based publications. What about capturing some video of customer testimonials during a commercial photo shoot and posting them up on YouTube? Actually, in this case, Nikon’s video mode is perfect for astrophotography, as it allows high dynamic range, high frame rate videos of planets and the moon. I for one would love to have this “half baked” feature on my Canon, since I’m already doing videos with the 40D, albeit in a pretty clunky and limited way. I do lots of Christian event photography, most involve working with Sr. High students. There is a huge demand for video, but I just can’t bring myself to put the camera down and shoot video. I’m a serious shutterbug, and it pains me to ditch the camera and dig out my video cam. I will always feel better and look forward to doing video with my DSLR. Enhance your still photo slideshows with short video clips sprinkled in. Think wedding assignments, or a documentary of your travels / vacation. For the rest of us who can’t always bring a camcorder along, it’s comforting to know that you can capture video clips anytime you have your D90 with you. … a box full of MiniDV tapes I never pull out because of the effort it will take to convert, clip and make them viewable by a sane person. 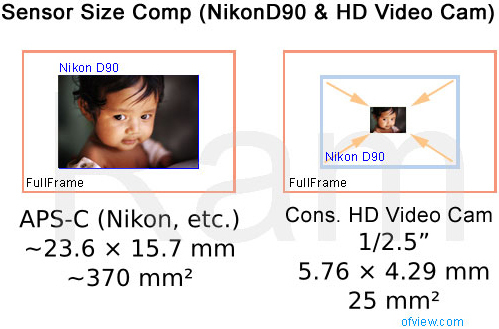 The 25 mm2; video cam sensor looks really tiny compared to the D90’s 370 mm2 APS-C sensor. Believe me, people spend upwards of $1000 and many hours converting their small sensor Canon HV20s to take SLR lenses (vibrating ground glass plates, image reversers, etc), even while losing several stops of light and manual focus. To have both in one body will be an immense tool for creative people. HV20 macro test from Lucasberg on Vimeo. To view a HD version of the video and read about what lenses were used, click here. The HV20 has now been replaced by the Canon Vixia HV30. Current examples of video cameras that come with a large sensor are Panavision Genesis and Red One (which records at 11 Megapixels and 60 fps). Bravin Neff says that if you’re looking elsewhere, you’d need to spend upwards of $17,000 USD to get the video capabilities offered by the D90. As an alternative to the Panavision and Red cameras, Cesar Rubio shared a $7,500 USD project which is based on a large-sensor, Pike F-145c camera (720x1280 progressive) recording with CineForm Raw. Michael James reveals a sub-$2000 option, which is to use a Cinevate Microprocessor Managed 35mm Lens Adapter to attach SLR lenses to a high-definition Canon camcorder or the highly-acclaimed Canon XL2 camcorder (although you would lose the benefits of having a large sensor). Although the XL2 is able to use any Canon EF lenses with the use of an adapter, but you’ll have to multiply the focal length by 7.8 on account of its small sensor — more information on DVInfo.net. Mounting a long telephoto lens such as the Canon EF 800mm f/5.6L will turn the XL2 into something akin to a telescope with a 6,240mm (35mm equivalent) focal length, which makes the setup suitable for surveillance work. So, where small sensors lose out to bigger ones in terms of capturing images with low noise or at wider angle FOV (field of view) and shallower DOF, they win if you need to shoot subjects that are far away. Three advantages of video capture on the D90 compared to using adapters is no loss of light or image softness, and you don’t have to deal with an inverted image. Greater control over depth of field (DOF). Specifically, you can capture video with super-shallow depth of field and have the background totally blurred out for that artistic effect. Larger pixels (due to lower pixel density) means reduced noise in the captured frames, which is great for low-light videography. Larger pixels also mean your clips have better quality. It cost HIGH dollar to achieve shallow DOF, manual focus, lens interchangeability in a pro video camera. A mere look at the pricetag of pro video lenses can hurt your eye. Even if you have the money you only have so few to choose from. Now Nikon brought this to a sub-$1k DSLR. You can now control DOF, precise focus, shoot movie with your 300/2.8 or macro or fisheye to achieve effects that make indie movie makers drool. If the CMOS sensor is 12 MP, probably they will “skip” every 2 pixels to be able to record 720p with the whole sensor size. Cesar also linked to an article on CCD vs CMOS sensors for video capture. The Red Epic camera can shoot at 100 fps using a 20 MP sensor. The output from such a camera is meant for the big screen in theaters. Locking the exposure, WB and focus could potentially create some surprisingly professional looking video after dubbing in some decent audio.